Supplying Tachograph Stationery for over 35 years. NOTE: GB Tachopak Ltd are suppliers of tachograph stationery, digital tachograph systems, compliance support, training and services to UK markets only. VOSA have stated that 85% of issues found during roadside inspections should have been detected by the driver carrying out a proper walk-around inspection prior to taking the vehicle out on the road, or by noticing changes in the vehicle handling or behaviour whilst in use. These common issues can result in fixed penalties or, in certain cases, endorsements being issued to the driver, a record of failing on the operators licence and changes to the operators OCRS (Operator Compliance Risk Score). The most important element of carrying out these pre-use inspections is that they reduce accidents and incidents on our roads, they improve vehicle longevity and they save lives. The drivers check is the final inspection before a vehicle hits the road. It is an important one. Make sure it is carried out correctly. 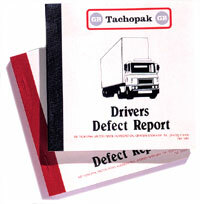 GB Tachopak are able to offer Daily Defect Report Pads containing the elements required for walk-around checks for both HGV and PCV. The books can be purchased online http://www.tachopak.co.uk/tachograph-systems.shtml or by phoning our Sales Team on 01472 210102.